This paper focuses on the relationship between the bond strength of masonry assemblies and fabrication and curing techniques used to construct and condition test assemblies. 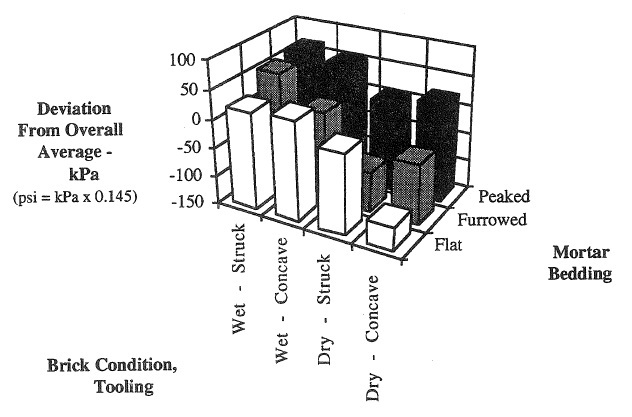 The study was conducted using concrete masonry brick units and clay masonry units. Variables investigated included: altering the moisture condition of units when laid, using different mortar bedding techniques to fabricate specimens, finishing mortar joints using concave tooling versus striking the joint flush with the face of units, and employing different curing procedures during the time period between fabrication and testing of specimens. Of the variables evaluated in this study, unit conditioning and curing procedures have the greatest influence on the development of bond strength. The paper is based on experimental work conducted by Holnam, Inc. at Holly Hill, South Carolina, USA. Experimental methods, data, results, and conclusions are included in the paper.